Lithuanian cuisine shares many influences with Polish cuisine and and Ashkenazi Jewish cuisine. German culinary influences are also present, and there are also influences from further afield, such as the dish Kibinai, which has originated with the Karaite Jews of the Crimea. Bulviniu kukuliu sriuba - A soup made using minced potatoes, shaped into balls and then boiled in milk. Vištos sultinys - Chicken soup. Sauerkraut soup - Sauerkraut soup, with onions, carrots and pork, and seasoned with pork. Baršciai - Baršciai is the Lithuanian version of borscht (beet soup), sometimes containing chopped mushrooms as well. Sometimes butter or sour cream are added and blended into the soup. Šaltibaršciai - A cold borscht soup, made using cooked or pickled beets and chopped vegetables. It has a very distinctive shocking pink color, and is often served with chopped hard-boiled eggs, sour cream and hot boiled potato. Balandeliai - Cabbage leaves stuffed with meat, then braised. 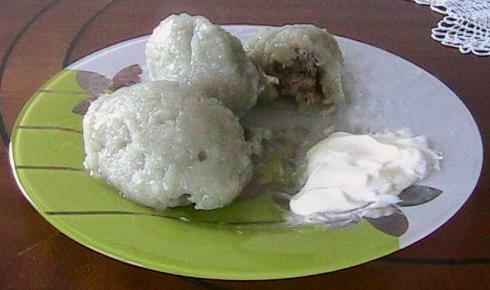 Cepelinai (also known as "didžkukuliai") - Often considered the Lithuanian national dish, cepelinai are potato dumplings stuffed with meat, cheese or mushrooms. They may be garnished with onion, sour cream, or spirgai (fried pork underskin fat). Bigos - Known as "hunter's stew" this dish is stew made with meat, cabbage and sausage. A variety of different recipes, each using different types of meat exist. Kibinai - This dish originated with the Karaite Jews of the Crimea, and is simply pastry stuffed with mutton and onions. Šašlykai - The Lithuanian version of shashlik kebabs. Šašlykai is cubes of pork, marinated and then cooked on a skewer over an open, preferably birch wood, fire. Šaltnosiukai - A unique Lithuanian type of dumpling, flavored with lingonberries. 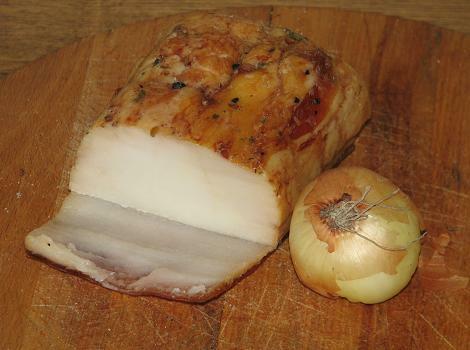 Lašiniai - Unrendered pork underskin fat that is often eaten in sandwiches. The sandwiches are made using unbuttered bread, and onions are often added. Idaryti pomidorai - Tomatoes, sliced into halves, then stuffed and garnished. Idaryti kiaušiniai - Eggs, hard boiled, then sliced into halves, then stuffed and garnished. Lietiniai - Thin pancakes filled with ground (minced) meat and cheese with cinnamon, or with minced sauteed mushrooms. Kedainiu blynai - Potato pancakes filled with chopped meat. Žemaiciu blynai - Potato pancakes. Kotletai - Soft patties made from ground (minced) meat. They are normally served potatoes and a sauce. Piršteliai prie alaus - Rolled up puff pastries. Skilandis (also known as "kindziukas") - This unusual dish is made using a pig's stomach which is stuffed with ground (minced) meat and garlic, and then smoked. The dish preserves well and thus remains edible for a long time. 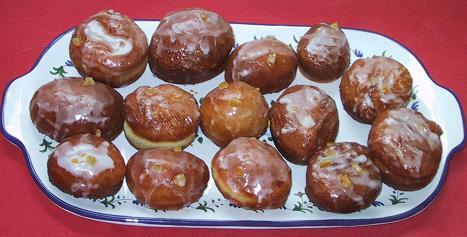 Spurgos - The Polish/Lithuanian version of donuts - known in Poland as "Paczki". A traditional filling is a marmalage made from fried rose buds. Žagareliai (sometimes known as "chrustai" or "krustai") - Twisted deep-fried pastries covered with powdered sugar. Šakotis (also known as "raguotis") - The Lithuanian version of the German "Baumkuchen", but also traditional to Lithuania. Šakotis is a cake prepared by painting layers of batter on a rotating spit in a special oven, and has a distinctive spikey appearance. It may be served plain or decorated with chocolate and flower ornaments, and is popular at celebrations including birthdays and weddins. Kuciukai (also known as "šližikai") - A dessert (small baked rolls) traditionally eaten on Christmas Eve (Lithuanian: Kucios). This book is, essentially, a love story. The story of an Irish girl who fell in love with a Lithuanian man, then fell in love with his country and its food. The book contains nine of June's favourite traditional Lithuanian dishes, including kugelis (potato pudding), cepelinai (potato dumplings), koldūnai (pasta dumplings) and šaltibarščiai (cold beet soup). The recipes are explained in detail with step-by-step instructions and illustrations where required, making this book ideally suited to anyone attempting these dishes for the first time. Substitute ingredients are suggested where certain ingredients might be hard to find outside of Lithuania. Each recipe is accompanied by a short preamble about June's life in Lithuania and how the recipe was developed. The book also contains a number of stunning photographs of the Lithuanian landscape and wildlife. Receive the e-book free of charge when you buy the paperback edition. More than a cookbook, Festive Ukrainian Cooking is also a definitive account of traditional Ukrainian culture as perpetuated in family rituals and lovingly celebrated with elegantly prepared food and drink. "Art of Lithuanian Cooking is a culinary showcase of palate-pleasing regional delights." --The Midwest Book Review "Here is a collection of Lithuanian recipes that will be welcome on any table." --The International Cookbook Revue This favorite Hippocrene cookbook includes over 150 authentic Lithuanian recupes such as "Fresh Cucumber Soup," "Lithuanian Meat Pockets," "Hunter's Stew," "Potato Zeppelins," as well as delicacies like "Homemade Honey Liqueur," and "Easter Gypsy Cake." The author's introduction and easy step-by-step directions ensure that even novice cooks can create authentic, delicious Lithuanian recipes. What is Lithuanian food like? Crunchy potato pancakes topped with sour cream, baked casseroles, stuffed meat dumplings with rich bacon gravy, cheesy doughnuts - it is just part of the foods you will find in this compilation of the most popular traditional recipes that every Lithuanian knows and loves. Milda Brighton takes you into authentic Lithuanian kitchen, sharing traditional comfort food to warm your heart. The classic recipes, including potato zeppelins, yeast-risen pancakes, minced meat cutlets, curd cheese cake, bring the taste of this unpretentious, comforting, and wholesome cuisine to your table. Complete with clear instructions as well as mouth-watering full-colour food photography, The Best of Lithuanian Cooking is more than just a handy recipe book. You will learn about influences that shaped Lithuanian culinary traditions, its ingredients, unique kitchen tools and preparation methods. With the most popular breakfast food, appetizer, main courses and dessert recipes inside, you can prepare a full traditional set of Lithuanian meals in your home kitchen. Milda Brighton is a cooking aficionado, a fan of ethnic cuisines, and an author of specialty cookbooks. Her books are focused on recipes, techniques, tips & tricks of the Lithuanian kitchen in particular. Milda also manages a blog dedicated to Lithuanian cooking (www.LithuanianHomeCooking.com), which supplements her cookbooks with useful information about local ingredients, culinary heritage, food culture, and new recipes. Everyone has experienced that fresh baked cookie smell and thought of some cherished family member or friend. The author’s goal in writing about ethnic food is to have the reader experience the same thing. For the author the smell of ethnic dishes like Kapusta (cabbage) Soup or Kugela(is) (potato pudding) isn’t the smell of cabbage or potatoes that is memorable but lunches at his grandmother’s house with his family, a welcome break from work at the family business next door. One problem in accomplishing this goal is that the extinction of ethnic foods in this country has been ongoing since WWII. Families with less time to prepare traditional meals fled to the supermarket to get the fix’n for the their meals, some already prepared and needing only heating. The author sought to identify popular Lithuanian dishes and publish them in modern recipe form with standard cooking units. The author and several relatives and friends shared recipes and the memories of cherished family members and events of the past. The book traces the lives of two families from the arrival of the author’s grandparents from Lithuania in 1904 and membership in the Holy Trinity Catholic parish in Hartford, CT. through a depression, two World Wars, the Vietnam War and the 60’s all the way to present day. The book describes these historical events and the resulting changes in the family fortunes including the family food heritage. The result is the best of his family’s Lithuanian recipes and all the laughs and tears that went into them. The carefully compiled selection by Baltic specialist Silvena Johen conveys the eating traditions of Estonia, Latvia and Lithuania. Supported with over 300 specially commissioned photographs, the reader can absorb the diverse influences and relish the rustic tastes of these three little-known cuisines. Blank cookbook perfect for secret family recipes from mom or grandma to carry on your own little recipes in your kitchen to cook for a lifetime passed down from generations from mother to daughter. Lovely European ancestry gift idea for anyone from Lithuania or Lithuanian-American who loves cooking Lithuanian cuisine and food. As in the Nordics, there has been a surge of interest from Baltic folk to identify more strongly with their food history—and display it proudly. This book celebrates that, identifying traditional dishes from each of the three countries and adapting them to create accessible and delicious recipes suitable for home kitchens the world over. Rather than strive to be authentic to the core, Bajada has selectively picked the best for international palates, curating a mix that is a combination of traditional and modern. At its heart, Baltic shows the commonality with other northern European cuisines—what's cooking is dictated by the produce at hand, as well as the enthusiasm of chefs and cooks there. Baltic's package is also visually beautiful, with the author capturing the color and vibrancy of the produce, local culture and landscapes as these countries emerge from nearly fifty years of Soviet rule, reconnect with the past, and embrace new promise for the future.